Quirky 18th century British multi-sheet wall map of the Near and Middle East. First Part of Asia, being Turkey, Arabia, Persia, most of India and Tartary. 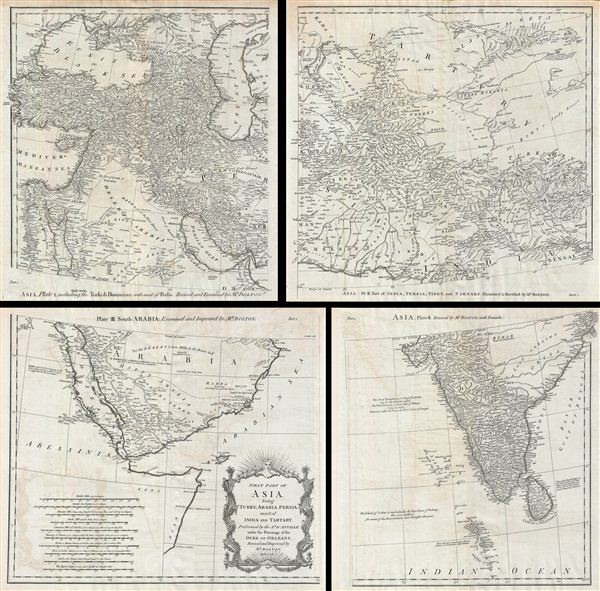 A curious and uncommon four panel wall map 1786 map of India, Persia, and Arabia by the english publisher M. Postlethwayte. Published in four separate panels, this map can be either joined as a single massive map as assembled, as above, in separate panels. As a whole the map centers on Persia, covering from Istanbul to eastern India and Tibet, and from the Black Sea to the Maldives. Postlethwayte derived this map from the influential French cartographer J. B. B. d'Anville's similar map of 1751, which here has been re-engraved, updated, and translated into english by S. Bolton. If offers excellent coverage of the central Asian portions of the Silk Route naming the centers of Samarkand, Bukhara, Lop Nor, and others. At the bottom center there is a decorative title cartouche of a rococo ethic. As this map was being edited, the eastern portions including Turkey, Arabia, and most of the modern day Middle east, were under the waning hegemony of the Ottoman empire. In Arabia, the first 'Saudi State' had already been established in 1744 and, though owing nominal allegiance to Istanbul, dominated much of the central Arabian Peninsula. The presumably more valuable costal lands and river valleys of Mesopotamia (modern day Iraq) remained under direct Ottoman suzerainty. Persia at this time was itself experiencing the early years of the short lived Zand Dyansty who ruled from the capital city of Isfahan – identified here. The Zand ruled Persia for roughly 50 years until, in 1794, Aga Muhammad Khan overthrew Loft Ali Khan, last Shah of the Zand Dynasty, and relocated the capital to the new city of Terhan. The subsequent era, the Qajar Dynasty, witnessed numerous military conflicts, the rising powers of Imperial Russia, and the loss of much of Persia's territory. India meanwhile was quickly falling under the control of the British east India Company who, from a few coastal outposts, were rapidly asserting their authority over most of the subcontinent. One year after the issue of the issue of this map the outbreak of the Seven Years War largely ended France's colonial ambitions, leaving only indigenous nations to stand against British imperial ambitions. eventually only Sultanate of Mysore, under Tipu Sultan, remained independent. By 1799 Tipu Sultan had been defeated and all of India fell under the at least nominal control of the British east India Company. This map was prepared by Samuel Bolton and engraved by R. W. Seale for issue in Postlethwayte's 1755 edition of the Dictionary of Commerce. Plate 1 measures 16 inches high and 14.5 inches wide. Plate 2 measures 16 high and 16.5 inches wide. Plate 3 measures 15 inches high and 17.25 inches wide. Plate 4 measures 15 inches high and 13.5 inches wide. Very good. We are most likely the first to have unfolded these rare maps. Original fold lines visible. Blank on verso. Paper shows slight warping. Set of four maps. Minor offsetting. Size given is for full map, if joined. Presents well framed tightly or professionally joined into a single map.